I own a single album by Mors Principium Est, Inhumanity. I remember buying it during my years being quite a bit on a melodic death bandwagon, so when others were saying the Finns are their own unique kind of melodic death metal I had to get a glimpse. Alas, something did not click between me and Inhumanity, so I never followed Mors Principium Est since then. Consider me deficient or ignorant or both. Many would say it was my loss. When Embers of a Dying World came across my listening deck I wasn’t on a mission to give Mors Principium Est another chance, but was simply curious. When one of the most dramatic intros (Genesis) I have heard in a while started playing, frankly, I was intrigued. What followed in Reclaim the Sun was melodic death metal with a ton of engaging flair. There was enough hard edged thrashy riffs, modern arrangements, emotional retching vocals and a fantastic dominant chorus hook, which made me determined to explore Embers of a Dying World to its fullest. It also made me think if this is going to be along the lines of Dark Tranquillity formula, then it would not be bad, and everybody who ever read my reviews of the Swedish masters knows I am a huge fan. 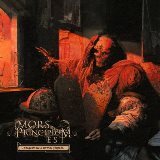 I can’t speculate whether die-hard Mors Principium Est fans consider some Embers of a Dying World moments to be similar to what Dark Tranquillity does these days to be a good or a bad thing, but I certainly detected similarities. Just like Dark Tranquillity Death is the Beginning has cleaner gothic moments contrasting with harsher chorus, there are female backup vocals, there is an overall enveloping atmosphere, and even some of the vocal phrasing follows Dark Tranquillity template. Good or bad, but what I dabbed to be “melodic death metal in the modern Dark Tranquililty fold”, these tracks (Reclaim the Sun, Death is the Beginning, The Ghost) appealed to me quite a bit. The Ghost, for example, starts with keyboard droplets, develops into a torrent of double bass and riffs, discusses fear of death lyrically, with emotions rolling on high, then dives into a pre-final breakdown and closes at peace. To call Embers of a Dying World a Character clone would be a mistake, however. Mors Principium Est makes a very conscious effort to broaden the envelope. On one end there are tracks with drier, more aggressive death thrash riffing (Into the Dark, In Torment, The Colours of the Cosmos). Slowing down in choruses and solo flourishes (something the band’s main songwriter Andy Gillion is very good at), these songs hint at At the Gates, Dark Tranquility from The Mind’s Eye period or Sacrilege. At the same time there is modern synthetic angle to the album, where darkness wafts through the guitar/keyboards interplay, with some rhythmic slams (Masquerade), and you have an impression that you are watching a Matrix movie with a kaleidoscopic picture of futuristic devastation in the broad view. There are plenty of breakdowns here, downtuned thumping riffs (The Drowning), but eventually you learn to like them. Then there is also big production, at times bordering on symphonic (Reclaim the Sun). Eventually, Mors Principium Est actually go overboard and attempt for a monumental symphonic exit of a song, channeling their own Grieg or Sibelius in Apprentice of Death.